I'm not saying that strange, undiscovered creatures - perhaps even some rather large ones - do not swim the depths of this planet's oceans and lakes. However, I must confess that far too much misidentification is being allowed to perpetuate legend and further clutter the facts. With the exception of aquatic mammals, most lake, river and sea creatures swim laterally, swishing their tales or bodies from side to side. This serpentine mode of swimming is common among most reptiles and some amphibians too. 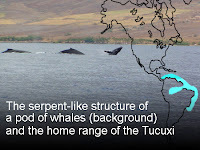 Yet the history of Lake Monsters and Sea Serpents is replete with sightings of the "humps in the water" variety, leading me to believe that what has been mistaken in the past for sea serpents are, in fact, pods of whales or dolphins. "Since mammals originally evolved on land, their spines are optimized for running, allowing for up-and-down but only little sideways motion. Therefore, marine mammals typically swim by moving their spine up and down. "[Wikipedia]This is a simple, logical explanation for many sightings in our oceans and seas but how can we explain those in lakes and rivers? One of the smallest Dolphins is a Tucuxi, which measures only about 4 feet long and plies the waters of the south Caribbean and along the northeast coast of South America. But this creature's range also extends more than a thousand miles inland on the Amazon. Other river dolphins such as the Boto and La Plata are exclusive to the Amazon. Still others can be found in China and Southeast Asia. Could a similiar, unknown species of dolphin, whale, or porpoise (Cetaceans) exist at higher latitudes? At least one species of whale has been documented in the vicinity of Lake Champlain, albeit a prehistoric one. However, a relic prehistoric whale species or its descendent might be the answer to what has been witnessed over the years. These cetaceans, traveling closely in a pod, would appear to be a long, vertically undulating snake to someone from a distance. But this discover itself would be quite a milestone. It is important to look for the most logical and the simplest explanations first. If we simply chase every half-baked story in a frenzy of zeal, we will end up looking like the very "kooks" many paint us to be. My advice has always been: be your own worst enemy. Rip your theories to shreds before anyone else can. Think of all the angles of attack beforehand and test them first. You will find yourself presenting stronger arguments in the future. In a recent edition of the publication, UFO Magazine, author Farah Yurdozu discusses "Metropolis as Prophecy". In this thoughtful work she notes that in 1918 the notorious Aleistair Crowley conducted a dark magick ritual which was thought, by some, to have been responsible for opening a gateway ("a stargate") between realities or distant celestial locations. This was further compounded by a follow-up ritual, called the Babylon Working in 1946, according to Yurdozu. It was said to have been conducted by the Crowley group called the Ordos Templi Orientis and involved a rocket designer Jack Parsons, future founder of Scientology L. Ron Hubbard and unnamed others. 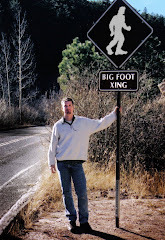 It was followed, a year later by the recognized beginning of the 'UFO age' with the Kenneth Arnold sightings in Washington state. (UFO Magazine, vol.24, no. 4, Issue # 157, page 20f). The inference is plain: this group cracked open a doorway and left it open allowing all kinds of mischief to slip into this reality. At first glance, it is an intriguing idea. Does it hold water as the old saying goes? At one end of the spectrum are the 'alien astronaut' proponents and at the other the 1946-47 sightings. Some will point to an article said to be in the The Missouri Democrat dated October 19, 1865 about a mysterious sky object. Others will note the 'airship flap' of the late 1800's and so forth. What if the doorway idea was correct? What other 'evidence' might there be that the door opened and, if opened, then could it be 'closed' now? Crazy idea, right? Then you begin to think about the high strangeness which seems to mounting under the shadow of coming shift of our own realities in 2012. NORMAN — The new paranormal suspense novel, “The Mound,” from authors Marilyn A. Hudson and Cullan Hudson has been a long, collaborative, evolving process from the very beginning. “The Mound” tells the story of a group of individuals from different walks of life converging upon a haunted hotel in eastern Oklahoma and what happens when ancient evil awakens and doesn’t like the group meddling in its affairs. Author Marilyn Hudson will be on hand at the Full Circle Bookstore in Oklahoma City at 3 p.m. Dec. 17 to promote and sign copies of her new book and talk about some of her other work as well. norman etc. caught up with Hudson this week to talk to her about her newly released project and what it was like writing a book over several years with her co-author Cullan Hudson. When asked about the genesis of the project, Hudson made no bones about the length of time and effort spent by her and her co-author in the completion of their yarn. They knew from the very beginning that they wanted to do something mysterious and in setting and gradually worked their way towards genre fiction. “Some people have called it a paranormal suspense, some people have called it a horror, we just like to call it a really good story,” Hudson said. “We basically kind of played around with some of the motifs that would be popular among anybody whose done any kind of legendary, mysterious studies about Oklahoma. We picked the hotel because of all the stories that have come from the Skirvin and all of the wonderful hotels that are located around the state. From the beginning the entire process was completely collaborative, with the original story coming to fruition from a batting back and forth of ideas and manuscripts to one another. Through that process they gradually came up with the structure of the story. 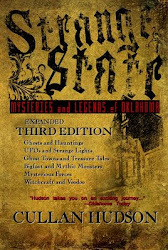 As to coming up with the setting for the work, both co-authors have always loved the magnificent ghost stories that have arisen from local hotels like the Skirvin in Oklahoma City. “We both just came to realize that we both just love old buildings and hotels and that you could do a lot with a hotel as opposed to a private residence,” Hudson said. “The potential for different story lines was just much better. So we just began to kind of move into that, and weave with it some threads of alternative history that interested us. Coming up with so many ideas, characters and plot lines between the two of them, the book formed itself as much through editing as it did with the writing of the original manuscripts. Hudson reported that the pair have almost ninety percent of two sequel stories in place already that the duo are working on together. So, you can expect to hear a whole lot more from Marilyn A. Hudson and Cullan Hudson in the mysterious tales department. 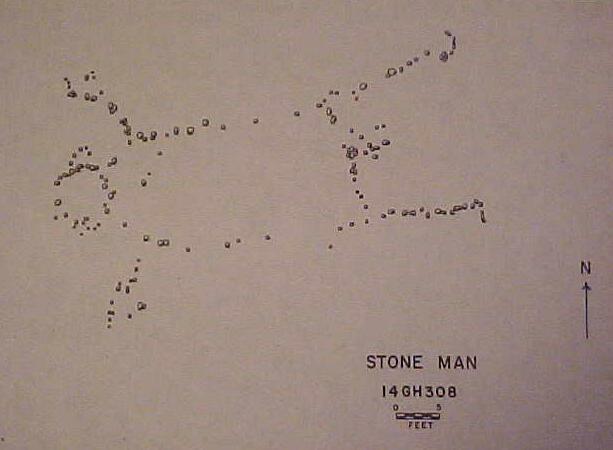 Many of us are familiar with the Nazca lines of Peru or the chalk giants of England, but lesser known--and closer to home--is the Penokee Figure of Graham County, Kansas. Resting atop a hill above the Solomon River Valley, the Penokee Man (or Indian as he is sometimes referred) is comprised of more than 100 stones ranging from 6 inches to more than a foot wide. The figure's entire dimensions exceed 57 feet in length and over 30 feet wide. No one knows exactly who built it or how old it is precisely. 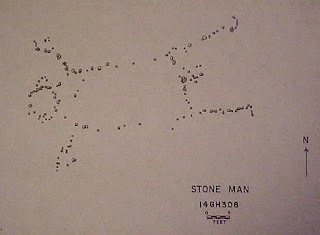 An 1879 examination by a Harvard paleontologist likened it to other giant stone figures found throughout the northern plains regions, including human-like figures and the famous medicine wheels. Kansas, long made famous for the strangely colored roadway leading to an even more bizarre colored city, recently was host to another kind of event. It was, some might say, equally strange. OZUFO explored in Lawrence, Kansas not only the idea of UFO's but various other aspects related to how people interpret them, how society views them, and the possibility of disclosure, but mostly on censorship (formal and informal) of the topic itself. Everything from the nudge and wink news caster recounting a story to the threat of bodily harm to those who experienced strange events was explored. Despite recent White House assurances to the contrary, there is still the possibility that the truth remains hidden behind a curtain with perceptions controlled by levers and knobs of censorship and disinformation. The truth spills out in tiny drops and leaves a trail leading back to larger possibilities. The 'secret NASA' long thought to be a product of fevered cold war imaginations and UFO hysteria has now been recognized as truth. Other leaks and clues have likewise been - quietly - released officially providing legitimacy for some wild theories: Operation Paperclip and the psychic operations experiments of the military just two examples. Where is the modern version of a dogged Toto who will pull aside the curtain once and for all? Who, most importantly, will we find standing there as the manipulator of reality? View a video clip on the OZUFO Conference here. Over the past couple of years, earthquake frequency and strength have risen in Oklahoma, a state most wouldn't equate with such tectonic activity. In fact, 2010/11 has been the most active so far, and just days ago the Sooner State saw its strongest yet--at nearly 6 points. I've blogged about this increased activity before and postulated whether it could be a precursor to another event along the New Madrid fault, a potentially dangerous scenario for those cities along the Mississippi River. But in Oklahoma, the Meers Fault has been active as well, and one wonders if it isn't becoming something with which Oklahomans will have to deal with in the future. Records of seismic activity in Oklahoma are less than 100 years old, so in a geological sense we're quite ignorant as to what might be "normal" for this region. Is this a new threat emerging or a cyclical activity that will subside with time? We'll have to wait and see. Check out the Earthquake tag below to read more. A 130-pound mountain lion was found dead along Oklahoma State Highway 81 this past week. Biologists from the Wildlife Conservation Department have begun a necropsy to learn more about where the animal came from and what it had been feeding upon. Fewer scientists are as quick these days to discount a hypothesis known to cryptozoologists for some time: mountain lions are making a comeback. Read more HERE. New Orleans UFO or Just Another ROD?